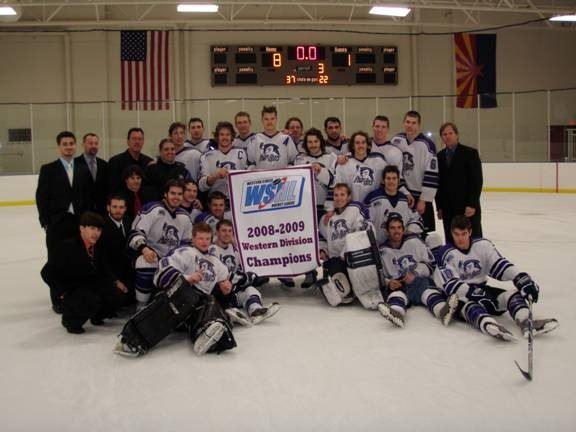 The Phoenix Polar Bears, Arizona’s Junior A Hockey organization clinched Western Division Championships of the Western States Hockey League (WSHL) in an 8- 1 win over the Valencia Flyers Sunday at Polar Ice in Gilbert. They meet the El Paso Rhinos next weekend in El Paso, Texas for the 2009 Thorne Cup (WSHL championship) as they drive towards a sixth Thorne Cup victory in eight years and another shot at the USA Hockey Tier III Junior A National Championships. The win over Valencia clinches the Polar Bears invitation to the USA Hockey National Championship making them the only team in USA Hockey history to go to the national tournament for eight straight years. With home ice at the Desert Schools Coyote Center (Polar Ice, Chandler, Arizona), the Phoenix Polar Bears have won the Western States Hockey League (WSHL) Thorne Cup five out of the last six years, were the silver medalist in 2002, won the Junior B National Championship in 2003, and won the Tier III Junior A National 2008 National Bronze Medal. With a regular season record of 42 wins and 6 losses, the team is a crowd favorite again for 2009. Unlike many USA Hockey teams, the Polar Bears have 18 local players on its roster, young men who have been groomed in local hockey programs to a level of National excellence. The other half of the roster brings players from around the US and Canada. “It’s rewarding to see players who have developed through our programs rise to this level of play” shared Brad Berman, president of Polar Ice Ventures and Defensive Coach for the Polar Bears. “It’s what this program is all about – helping young players develop the skills and a love of the game.” Amateur Hockey has become a thriving business in the Desert since the Phoenix Coyotes made their home here in the 90’s. Leagues begin with Mini Mites and move up through the age brackets to the highest level of amateur play – Juniors. They next step for some of these players will be NCAA Hockey play and for a select few – dreams of future NHL contracts. Rinks across the valley groom the young players in Chandler, Gilbert, Scottsdale, Peoria and Phoenix. The Polar Bears are led by team captain Troy Crowley and assistant captains Curtis Kelner, Scott Skrudland, and Rocky DeAngelo. The full National Tournament Roster is provided in the insert at the end of this release. “We are proud to be surrounded by such a great group of dedicated young men. Each committed to reaching and attaining the National Championship with pride and purpose” stated Phoenix Polar Bears Head Coach and General Manager Harry Mahood. Posted in Blog, Family Stories, Real World Inspiration.